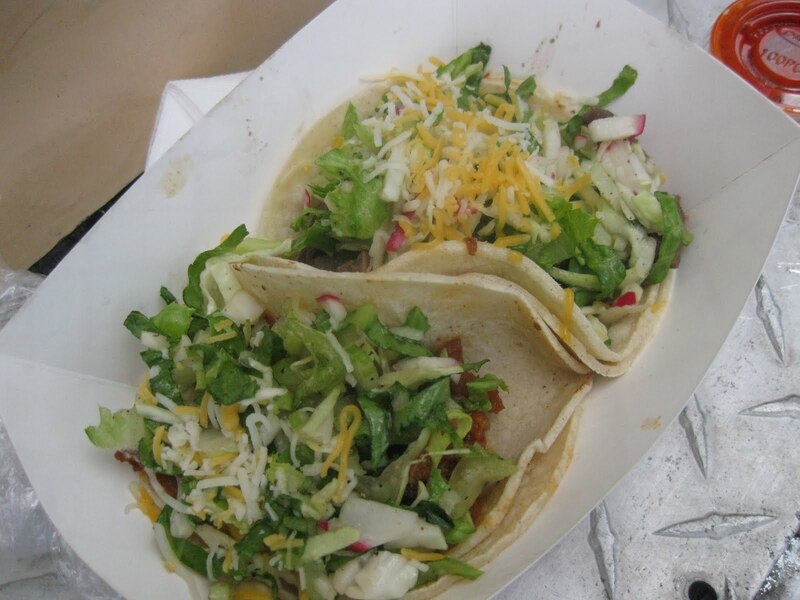 The myriad of food trucks vying for a spot these days is getting hard to follow, but since I’m on a food truck roll I might as well talk about Calbi, another Korean taco truck roaming the streets of Los Angeles. I caught it parked across the street from the Dim Sum Truck after we’d eaten our dim sum and ran across the street after we’ve eaten dim sum to see what they had to offer. I wanted to try the everything but didn’t have a lot of room left to stuff them down so I got one kalbi (marinated short ribs) and one taegi bulgogi (spicy pork) tacos. It took a few minutes and my tacos were ready, all wrapped up on a tray with plastic wrap. I ran back across the street and shared these with my friend. Both tacos were topped with lettuce and shredded cheese, the kalbi tasted okay to me but I definitely enjoyed the taegi bulgogi far better. My friend even said the kalbi taco was far better than the Peking duck taco from the Dim Sum Truck. I thought they were both just okay, nothing spectacular, and definitely not something I would go on a wild goose chase for. In fact, I’m not even sure I would choose them over other gourmet trucks because it was very average tasting fare. In LA, you can be sure there are other better choices for food — and perhaps, that’s why I didn’t see anyone in line at the Calbi truck. >I don't even know why they bother to park right right by other more popular trucks — I don't see any traffic in front of them, I mean do they even make money?